The Domaine de l'R is a fairly new, it was founded by Frédéric Sigonneau in 2007, and it is already counted by Chinon amateurs among the ones where cabernet franc shines. Frédéric and his parents have been living next door to Bernard Baudry, he was by the way a childhood friend of Mathieu, Bernard's son. Frédéric, whose family owned vineyards but rented them to different wineries, began to work at Patrick Baudry in 1997, staying two years there until 1999. He then worked at Fabrice Gasnier, an organic (and now biodynamic) vigneron 4 km away. Then at the end of the wine school in 2002 he went to Spain where he stayed 2 years, working on biodynamicly-farmed ungrafted vineyards. Back in France, he had an interlude of 2 years working in a conventional domaine before setting up his own domaine in 2007. His wines, which were then still under the radar by the mainstream wine media, were discovered by Olivier Grosjean, an out-of-the-box French wine writer during his visit at the Salon d'Angers in 2009. Cravant-les-Coteaux is a village located 8 km east of Chinon, at the foot of the hills running along the Vienne river. The AOC Chinon is spread over 19 villages and as of 2005, the AOC had 254 growers among which 238 wineries (221 domaines, 1 coop and 16 négoces). Chinon is of course Cabernet Franc country but the wines of the AOC are not always exciting when you source your bottles in the wine aisle of a supermarket. Happily, there is now a good number of wineries doing an excellent job at setting the bar high for what Cabernet Franc can offer. Frédéric Sigonneau with friends Frédéric was tasting a wine in his cellar with friends when I visited. The cellar is a deep horizontal cave under the hill in the back of the facility. Many wineries around here use these former quarries as cellar. During the 18th and 19th centuries, these private quarries yielded the blocks of sandstone from which all these buildings around were built, and the cool underground space was then used as a wine facility or for mushroom growing. Frédéric grabbed a glass and I joined the fray, tasting a first wine as other friends joined. His wife Charlotte had not yet arrived, she was to join us later at the end of the afternoon after she had brought back their two daughters from the school. __ Domaine de l'R, Le Canal des Grands Pièces 2012. Cabernet Franc. A central cuvée of the domaine, made since 2007 (the first vintage), named from the cadastral name of the parcel. Frédéric says that he made a short vinification here in order to have fruit and an easy drink. Cabernet franc can be hard-edged and rustic but here he wanted to express the fruit. Asked if it means it's supposed to be a wine to drink early, he says that it's what he tought initially, telling his customers at the beginning to drink it in the 2 or 3 next years, but when he opens a 2007 it provides the same pleasure, he says. These family vineyards were rented by someone else before 2007 and one day as he was asked to show older vintages for a wine event, he opened some of the bottles left over by the winery who made wine from this parcel and went to Bernard Baudry to taste them, but both Bernard and himself saw that there was nothing left in this wine, you couldn't even use it for cooking, Bernard said. The vineyard had been farmed with chemicals and the result was there in the glass, the wine was so different, it's like if it came from another vineyard. This cuvée is made from 6 parcels which he recovered at the legal end of the rent, the vines are aged from 20 to 50 years. This is the biggest cuvée of the domaine with 12 000 bottles on a total of 27 000. The early bottling is also because the markets asks it, the wine was positively reviewd by Wine & Spirits and sell well in the U.S. as well as Canada and Australia. The color of the wine is rather clear because of the short vinification. This was bottled early, in february and it was thus filtered. The mouth is full, a nice fruity wine. The vatroom and other buildings Frédéric gets a phone call as we taste, he tells us later that it was his cousin Vincent Girard who is a grower only (even if he makes a little bit of wine for himself or friends). Vincent wanted Frédéric to check if the grapes he was selling him were OK, but Frédéric said no, he trusts his cousin work, his whole 14 hectare being organic and tended with care. I had heard about Vincent Girard when I visited Helda Rabaut, as Helda works for this grower (she works as well as for Domaine de l'R and for Bernard Baudry by the way) and wanted also to buy him grapes. The trust is reciprocal and Vincent doesn't check the volume of grapes that Frédéric says he has picked, he just takes his word. Because of the quality of his vineyard management, Vincent Girard is a sought-after supplier and it's hard to get an allotment at this stage. This facility is literally backed to the hill, The vatroom being behind this large door and benefiting from the cool temperature of the sandstone cliff. The doors on the left open on the stables, beginning with the one of the horses (for one or two horses maybe) which could still go back into use overnight from what I saw inside, there was only some cleaning to do and storaged stuff to take away. On the other side along the hill's cliff, they have piles of rabbit hutches, and the cages are still inhabited by cute rabbits. At the very end near the vatroom door there is a large aviary samely backed to the hills' cliff with the hens inside. They get eggs from them and use their droppings occasionally for the vineyard. He says that they also do a good job at killing the snakes when one of them has the bad inspiration to crawl in their direction. La Familia vineyard After this first glass, Frédéric offers me to drive to the parcels, and we first go see La Familia, a vineyard owned by his cousin Vincent Girard and from which he makes wine. He points to the grapes and says that he doesn't need to go check, these grapes are perfect. He also purchases grapes to other organic growers for his négoce cuvées and he better checks the grapes there because some growers spray fertlizers and if he doesn't check he ends up with enormous grapes because of excessive addings. Plus when the yields are pushed too high you get totten grapes, the cabernet franc hates high yields, Frédéric says, and it likes being left late. He says this terroir here is mythical, and he rents 70 ares here. Asked about the total surface he's making wine from and counting both the family vineyards and the purchased grapes, Frédéric says that the family vineyards surface make 6 hectares (the cuvée Canal makes 45 % of this) and the négoce vineyards make 6 hectares, making a total of 9 hectares. Nothing changed on the Domaine de L'R vineyards since 2007, they're the same, no new plantings or parcel purchase. I ask about Helda Rabaut who I know works with him too : he says that Helda works only during the vinifdication, but she is his right arm here, and she overlooks everything in the chai following his intructions at that crucial time because Frédéric needs to stay permanently with the pickers to check that the work is done properly. He praises her work, saying he trusts her totally. I ask how she can do her own wines too if she works here, he says that she stops at 3pm at Domaine de l'R and heads to her own facility to work on her wines (she makes wine from a 2-hectare surface). His own picking team is by the way also doing the picking on her parcels, so they can harmoniously arrange the schedule. The parcel of the cuvée SO2 While we drive to another parcel, Frédéric tells about the issue of bringing back a vineyard hooked on chemicals and fertilizers to the real world or organic farming. He says for example that when he recovered a bit more than 3 hectares of the family vineyards from conventional growers who previously rented them, these vineyards looked in dire shape after these years of sprayings, but they recovered from one year to the next because they sort of remembered their initial organic farming which had been long enough for them to grow deep roots : They were more than 50 years old and before being rented to conventional growers, these vineyards had been well tended and plowed and they still had good, deep roots in place, they could make it without the surface roots when Frédéric plowed the inter-row overnight (10-15 cm deep only). His yields went down from the 55ho/ha the grower previousdly said he made to 41 ho/ha, he didn't put any fertilizer including organic ones and just let the vines go by themselves. On the other hand things were more tricky on another parcel, La Grésille (32-are surface) which he uses for his iconic cuvée "SO2", a cuvée made without any added SO2, any filtration or fining (web page with all of the domaine's cuvées). You can watch this parcel on the video above as Frédéric explains (in French), this 23-year old parcel had always been farmed with chemicals and fertilizers and it didn't like the transition to organic farming and the plowing, yielding the following years a very small load of grapes, but with these small clusters that were perfectly ripe, which is rare in this area, Frédéric vinified whole-clustered and made a beautiful wine nonetheless, which happens to be this cuvée SO2 without any added SO2. Unlike the older family vines that he recovered in 2007 and where the chemical farming had been temporary, these vines had never known a non-chemical farming and the roots were probably all at the surface from the start, and the plowing was thus a shock, making the yields tumble down from the probably 55 hectoliters/hectare to the 15 ho/ha Frédéric picked these recent years since 2007. He says that 2013 is really the 1st year since then where the vines seem to have recovered from the shock and grew more grapes (pic on right), he wonders about this beatiful load of fruit as we walk along the rows, saying that he will even be obliged to drop some of them, a big change from the previous vintages. He says you need to leave the vines by themselves in these circumstances, without IV sprayings and help, so that they know they have to adapt to their new, healthy conditions and find their pace. He'll adapt the pruning next year to get the right balance and the right load, not too small, not too big. The parcel "Les Folies" (70-year old) We then drived to "les Folies", a parcel of vines aged 70 years on sandy soil. The vines are incredibly twisted and circumvoluted, they show their age but yet seem to hold firm in the ground. The yieds are of course very moderate at this age. The juice here goes into the Cinq Elements cuvée. Concentional, mainstream wineries would have it uprooted because the yields are so low, when these naturally-low yields are why the wine made from them is so good. Frédéric works on it since 2007, and this vineyard also loved coming back to traditional organic farming, it didn't go through the shock experienced by "les Grésilles". Speaking of the low yields observed also in other vineyards nearby, the yields will always be low because the ground drains so well that vineyards with surface rooting struggle because it's very dry in summer, when his own still have the deep rooting. There a bit deficit in magnesium he says, pointing to such or such leaf but it handles the situation. We then look at the parcelle des preyottes (not sure of the spelling) which is located on a montille which is a vaguely hilly relief along the Vienne which is 500 m to 1 km away. The soil is clay/gravel on the lower part. The vines are aged between 50 and 70 and when they make analysis for the harvest it's always ripe, when you taste the grapes it's like pinot noir, the seeds are ripe too and it's refined and elegant. The yields are low too but he doesn't mind. The grapes go into La Folie du Noyer Vert and the rest go into Les Cinq Elements, and it gives the thin, delicate structure part of the wine, it's the spine part of two cuvées. The parcel is also named Butte des Maisons Bourdeaux. There are a few young vines that have been replanted by the former grower, and he still has a few missing ones to replant. The problem is that when you plow sometimes the tractor inadvertedly uproots a vine, this can't happen when you use herbicides and they have to make extra caution when they do the plowing. (see pic of grapes on right). 130-year-old vines (cuvée "Les Mains Sales") We drove further, on the flatland under Baudry and the facility of the Domaine de l'R, stopping at "les Grands Pièces" (cadastral name), a parcel of 1 hectare which is used for the cuvées of Les Cinq Elements and Les Folies du Noyer Vert. The cuvée Le Canal Des Grands Pièces is made of grapes from the canal and other parcels. The vines are 70 with gravel on the upper part and more clayish at the bottom. Frédéric picks this parcel in two times, the upper going into Les Folies du Noyer Vert and the bottom into Les Cinq Elements. Here again the vineyard is answering well to the return to organic farming. He has normally 30 to 35 ho/ha, this year this may a bit more but he'l prune in accordance to keep them moderate if needed. He'll replant massal selection for the missing vines, using the young vines' grapes for a cuvée of rosé so as to keep the old-vines cuvée distinctive. We then went to Les Folies du Noyer Vert, a family parcel which sits also in view of the facility of Domaine de l'R and Bernard Baudry's. they're really neighbors, Mathieu is 4 months younger than himself and he used some of their tools for his winery, his relation with Bernard is like father and son. The parcel makes 55 ares on gravel/clay. We drive close to there to a 3-are parcel on Les Grézeaux with vines that are 130 at least (pic above), they were replanted after the phylloxera and are still around. His fore-fore-grandfather died in 1917 in WWI and this parcel had not been planted by himself but earlier, so it's yet another generation older. The soil is deep gravel and crushed rock. Frédéric uses the grapes from there for the cuvée "Les Mains Sales". The vines are incredibly twisted and with strange shapes, but they're still in good shape for their age. It was farmed by Bernard before he took it over. Near the door we walked past big packs of sulfur for the vineyard, this is mineral sulfur, organic sulfur coming directly from a mine from Romania, much more natural than the one sold by the chemical companies where you always have petroleum residues. The only problem is you have to store it in a very dry place. They do whole-cluster fermentation for the cuvée SO2 but otherwise everything is destemmed, the destemmer being at the upper level above the ceiling. There's no air conditioning, the fact that the building is tightly backed to the cliff keeps it cool year around. He uses the cement vats only for the first fermentation because with his volumes he can't fill them all. If he was more into efficiency management he would get rid of three of these cement vats to make room but he can't come around of doing this, they're part of this place. There is a small adjacent miniature chai, also partly in the rock, this is where the six small stainless-steel vats are stored, and at the harvest, they're moved in the main vatroom under the hole through which the grapes will be funnelled, Helda doing then the foot-stomping. They manage small volumes in there, 4 vats for "les Folies" or 25 hectoliters, the cuvée SO2 making 15 hectoliters. That's what she does while Frédéric overlooks the picking. For the bottling they use a service company that makes a very good job, it is Christian Braud, the same that is used by Clos Rougeard, Philippe Alliet, Bernard Baudry, the bottling is very soft and slow. The door to the cellar under the hill We then walked to the cellar which is a long room dug into the hill and we tasted a few wines in a cooler atmosphere (it was hot outside on that early september day), the door slightly opened to let the light in. __ Cuvée X (Equis) 2012 (négoce). Made from purchased grapes, this is the négoce wine, with a style close to the one of the Canal des Grands Pièces. This is a cabernet franc of a morte classical style. Comes from Patrick Lambert's vineyards on Les Grézeaux. He resorted to do négoce wines with purchased grapes (organic, though) because the domaine wines sell very quickly and he finds himself without wine for certain cuvées. Very exciting nose. Sugary side in the mouth, the tannins are discreet. 3200 bottles. Made through a short vinification for the fruit, he says. He adds that the wine is good but it lacks the spark, the excitement here. It's vinified on native yeast like everything here. The only manipulation they do on the wines is a light earth filtration and a bit of SO2 (between 1 and 2 gr) depending of the wines (not on the cuvée SO2 of course). He adds the SO2 1 month after the malolactic, well before bottling. The wine has a short élevage in cement and reached the market in february. Frédéric tells me about his first encounter with Olif and Philippe Rapiteau in the Salon d'Angers, he didn't know them until then and Olif gave him the phone number of a caviste in Pontarlier (Jura), Au Bon Echanson, who took him some wine, and thanks to his story on his blog he found customers from Paris who took pallets of his wine. The RVF also wrote on him and the export took off... Before Olif discovered his wine he was wondering if he'd return to the Salon d'Angers the following year, few people stopped at his stand, the location of his table was not ideal, and with the 2000 or 2500 € cost of taking part to the Salon d'Angers, this didn't seem to be worth. __ Domaine de l'R Canal des Grands Pièces 2012, from organic parcels he recovered from 2007 to 2009. Lower yield, but with more fruit and magic. Very interesting and pleasant substance in the mouth, nice fruit to drink. He says that unlike gamay it's not possible to make a nice cabernet franc with high yields, this vineyard gave him 40 ho/ha and these are small-enough yields tp get this final quality. It's out in february but it stands time very well, he still has bottles from 2007 and when he opens one the wine tastes great. Opening Les Folies du Noyer Vert 2012 That's when Frédéric's wife Charlotte joins us with their two young daughters, the youngest, he says, snubs Muscat and table grapes at dessert but loves to eat his cabernet franc, she pushes the yields down... Charlotte is an enologist but she doesn't work with Frédéric, she is a technical consultant for the growers and wineriers in the Loire. She tried to help with Frédéric's wines but they didn't have the same approach and so she now doesn't interfere in his work and decisions. She says that she likes the resulting wines though, but wouldn't have followed his procedures (or the lackthereof). So Frédéric works with another enologis, a friend of his, but that's just for his analysis and data, Inter Loire, the organisation overlooking he samely doesn't follow his recommandations on adding SO2 at this or that stage. I ask Frédéric if he pays his COV (means "compulsory Voluntary Contribution") to the Loire wineries lobby. He does pay every year but he waits the 4th reminder mail of this wine administration to pay...[link to the group of farmers fighting the CVO system]. __ Domaine de l'R Les Cinq Elements 2011. Made from several parcels, les Folies, les Grands Pièces, le Noyer Vert and Les Preillotes. These are the last parcels to be picked and here the vinification and élevage are longer. The malolactic followed swiftly the first fermentation in 2011 (in 2012 it was completed only at the end of june). On the nose, I feel a higher freshness here. In the mouth, this is superb, it's fresh and full of life, very elegant wine. Charlotte says that the life force come from the quiet making of this wine. Bottled in december 2012. Makes 12 % in alcohol even if he printed 12,5 %. So light. This wine has a magic, it is a pleasure. The filtration must have been very light because the general feel of this wine is the one of an unfiltered wine. It's sold out in Paris and cavistes ask for more. This wine costs 10 € tax included for individual buyers here at the domaine. Very good value, excellent value. 6 € professional price. He made 8000 bottles of this in 2011 (total volume in the domaine : 27 000 bottles). __ Domaine de l'R Les Cinq Elements 2012. Not on the market yet. Same parcels and vinification, just that the malolactic took its time (no inoculation of course). The wine got its gram of SO2 one month after malolactic and now it rests gently in the cool. Charlotte reacts and looks surprised (the enologist speaks here) about the fact he waits a whole month after malolactic to add SO2, I'm witnessing the culture clash between two winemaking cultures, she underlines the risk-taking in waiting so long and he defends his choice. This cuvée is the one through wich he was put in the spotlight by Olif in 2009. __ Domaine de l'R La Familia 2011. Frédéric says that there is more substance, more power here, as it was picked at 13,5 °. From vineyards of Vincent Girard, his cousin and grower. Indeed a different wine, with a more tannic side. It was his first vintage on these vineyards and he bottled it in february. __ Domaine de l'R Les Folies du Noyer Vert 2011. These are small grapes that have been foot stomped by Helda, the higher part of the Grands-Pièces, (les Preillotes) parcel, usually very small load of fruit, Mauritania, he jokes. Very pleasant nose, the wine is quite translucent. Unfiltered wine, because it went through a longer élevage, and in casks which help deposit better the turbidity. Bottlled in heavier bottles, 320 bottles. Very nice wine, intense and light at the same time, with still the freshness. Costs 15 € for private buyers here, and 8 € for professionals (without tax). __ Domaine de l'R Les Mains Sales 2011. Made from this very old (130 years) 3-row parcel which always belonged to his family but was farmed (organic of course) for years by Bernard Baudry until Frédéric started his own domaine in 2007. The harvest here is destemmed by hand through picking grape per grape and putting them into a barrel, then left in there and rolled from time to time to get the juice coat all the grapes. Pressed two months later with a tiny press. Unfiltered wine, 12,2 % in alc. Few people know this cuvée, it's only available at Paris Terroirs, the restaurant La Grande Cascade in Paris (Bois de Boulogne), in Chinon (Enfin du Vin), and a bit in Holland. __Domaine de l'R, cuvée SO2 2012. Vin de France, unfiltered and no SO2 added (the other cuvées have very little SO2 added but here there's none). 2000 bottles in all. Sold out but maybe in Paris you can find a few bottles at Cointot Vino. Frédéric says that he could have tried to pass the [Chinon] appellation agreement but feared he'd be busted. Made from a 32-are vineyard. Pressed when the alcoholic fermentation is half way. Malolactic finished in june, then racked and hosed back in a vat from a two-meter height so that the CO2 get's out (it was full of gas). Costs 14 € tax included and 7 € without. Frédéric at one point told me that if he's working organic and making wine without additives, it is thanks to Christian Chaussard because when he studied at the wine school in Amboise, Christian Chaussard was teaching there and he had a lecture about organic and biodynamic farming, this was in 2001 or 2002. Chaussard had his students taste a wine, the cuvée "la Peau de mes Fesses" made in his Vouvray domaine (before he fouinded Domaine Le Briseau), few people know these wines bercause his production was very small. Frédéric recounts why he closed down his domaine : he had wanted to let grass and insects come back in his rented vineyard and the vineyard was denounced as been left fallow and the rent was invalidated by the owner. 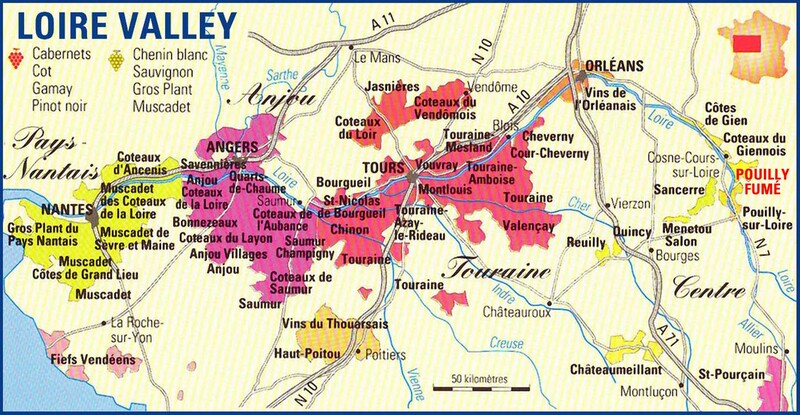 Given the mindset in Vouvray then, the move to let diversity settle back in the vineyard was considered as crazy. But Frédéric reminds that the Christian Chaussard wine he tasted that day was an incredible experience, enormous, such beautiful wine, and without any added SO2 either. Asked about the vintage for this la Peau de mes Fesses he says probably a 1997 or a 1998 and Christian had made only 300 bottles of this wine. The wine was delicious and it was a mind-opener for him, to this day he thinks that it's the best moelleux Chenin Blanc that he ever tasted. Before then he was more like being upset by the organic crowd and by those criticizing herbicides. Frédéric makes 8 cuvée today and he has plans to add a few, 4 to be precise, a cabernet franc from franc-de-pied (ungrafted) vines, a Chenin, a sparkling rosé and the Ribeira Spanish wine. She should be all, already a wide range for his size. The Domaine de l'R wines are exported to the United States (François & Jenny), the U.K. (Genesis Wines), Australia (Heart & Soil), Ireland (Nomad Wine Importers Ltd), Canada (Vinalis), Belgium (Troca Vins Naturels) and Holland (Bolomey Wijnimport).